One must look at the history of DC Comics to understand its future. In a world that has been overtaken by the comic book film, it’s pretty important to understand and learn about where the main comic companies come from and how they came to be. One of the most famous companies is DC Comics. DC Comics is commonly seen as the main rival to Marvel Comics and proved to be a venture into darker territory for the comic book industry. DC Comics is known for its eclectic mix of heroes and villains, ranging from the iconic Superman and Batman to the dastardly like Joker and Zod. DC Comics can lay claim to much of what made comics what they are today, but the question is, how did they come to such prominence? How were they affected by the comic book censors? And what launched characters like Superman and Batman to such meteoric measures of fame? This is the history of DC Comics. As with most things, DC Comics didn’t start with the intention of being what it is today. Initially, the company was started mostly for financial reasons. Its founder, Major Malcolm Wheeler-Nicholson, decided to start the National Allied Publications in the Autumn in 1934 with the sole aim of trying to turn a profit. To do this, they decided to get in on the pulp comic market that was emerging among younger audiences. They launched their first comic New Fun: The Big Comic Magazine #1 in February 1935. The comic was met with modest success, or at least enough profit to justify producing another. They did just that on December 1935 with New Comics #1. Interestingly, the size of this publication would come to represent the comic book standard that period fans and historians would come to call the Golden Age of Comic Books. Notably, New Comics #1 would run for a very long time, and prove to be a major part of the history of DC Comics. It would soon evolve into Adventure Comics, which continued for almost 50 years with its last issue being published in 1983 as issue #503. This means that Adventure Comics is one of the longest running comic series of all time. It proved to be so popular that in 2009 DC decided to rejuvenate the series with a new line of Adventure Comics with its own original numbering. The third and final title that Wheeler-Nicholson would give the National Allied Publications was Detective Comics, which had a cover date of December 1936, but was postponed until March 1937. This anthology series would cover exactly what you might imagine, acts of crime that were solved in a serialized and anthology like manner. However, this is not why Detective Comics is so monumental for the history of DC Comics. One particular character debuted in issue #27 of Detective Comics in May 1939, that character being the one and only Batman. However, by this point Wheeler-Nicholson had left due to mounting debt issues. In order to recount from the growing financial pressure, Wheeler-Nicholson had to take on comics peer Harry Donenfield as a partner in order to even get the first issue of Detective Comics out the door. Detective Comics Inc. was founded soon after but Wheeler-Nicholson was pushed out the door due to further cash flow issues. Detective Comics Inc. would soon buy the rest of National Allied Publications, resulting in a larger conglomerate of comic books. After a while, Detective Comics Inc. soon launched their fourth title known as Action Comics. You may not know it by looking at the title, but Action Comics was responsible for birthing perhaps the most iconic comic book character of all time, Superman, in Action Comics #1 in June 1938. This was the first comic book, ever, to feature the new character archetype of a superhero. It’s hard to underestimate the colossal importance of Action Comics #1. It’s so integral to the entire comic book industry that any original prints of that comic book can go for hundreds of thousands of dollars, if not millions. The character archetype of a superhero proved to be a sales hit which resulted in the creation of other characters like Batman. It was around this time that Detective Comics Inc. would become known colloquially as DC Comics. Further conglomeration and mergers throughout the years resulted in confusion in terms of brand recognition, so the fans of the company’s work soon adopted the simple DC Comics moniker for ease of mind. It would only be in 1977 that the company would formally adopt the name of DC Comics. The success of Action Comics and Detective Comics seemed to make the company eager to establish their dominant market share in the industry. Waves of aggressive court cases were handed out to other company’s characters such as Fox Comics’ Wonder Man and Fawcett Comics’ Captain Marvel for similarities to Superman. The success of the litigations were varied at best, and they earned DC more than a few enemies in the business. Superheroes proved to be a fad that died out fast. In the late 40s, superhero comics weren’t shifting half as fast as they used to so DC moved to comics that focused on more conventional film genres like sci-fi, westerns, comedies, romance, crime, and horror. However it’s worth noting that they were relatively tame, and so DC managed to avoid the vast majority of the mid-1950s backlash against comic books. Action Comics and Detective Comics would continue to be published right into the present day. The mid-1950s saw a small renaissance in the superhero genre with the introduction of The Flash by Julius Schwartz. The Flash had starred in previous comics, but a full revamp was completed for Showcase #4, which released in October 1956. The reimagining proved to be fairly popular and so a similar treatment was carried out for the character of the Green Lantern. This era of re-imagination would eventually lead to one of the most prominent superhero teams we know, the Justice League of America. It was this small renaissance that led fans to call this period the Silver Age of comic books. Even the mainstay characters of Superman, Batman, and Wonder Woman were radically overhauled, including Superman’s family ties and the extended Bat-family. Batman was reemphasized as a detective and Wonder Woman was refocused to have adventures in a more mythological context. This spree of reimagination did not go unnoticed. In fact, it was so consequential to the history of DC Comics that it actually influenced other companies such as Marvel’s Stan Lee to create other teams such as The Fantastic Four. In an unprecedented move, writer Gardner Fox and artist Joe Giella in Flash #123 introduced an official acknowledgement of a DC Comics continuity and shared universe between the characters. The Golden Age characters lived on a parallel Earth called “Earth 2” whereas the modern heroes lived on “Earth 1.” This revolutionary meta idea laid the foundation for what would become known as the DC Multiverse. Other forms of media started to take notice of the comic book industry as well. The famous 1966 Batman TV show provoked a spark in comic book sales for Batman. This increased popularity for a campier attitude towards comic books led to a significantly lightened tone in many of the DC Comics. Worst affected was Batman and Detective Comics as they proved to be the most popular. 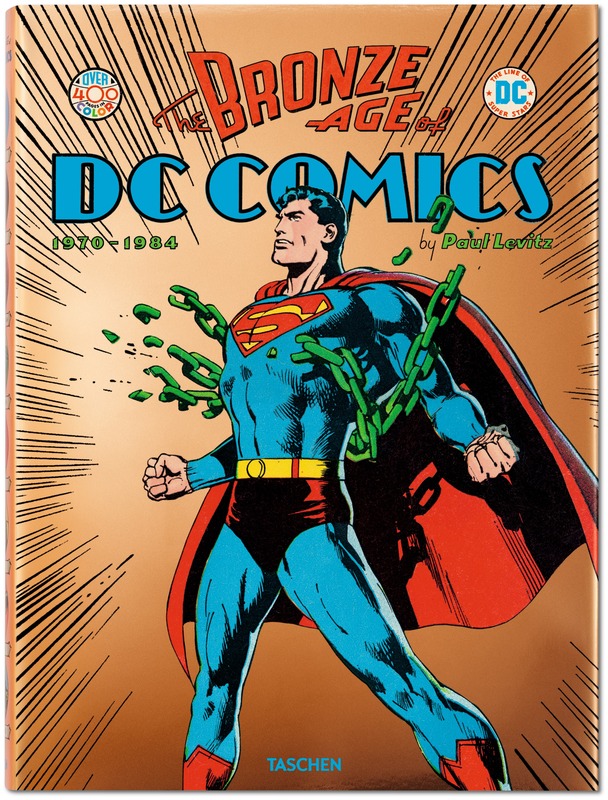 The Silver Age gave way to the Bronze Age in the 1970s and 1980s. With the relaxation of the comic book censors, comic books became a mature way to explore darker themes. Comics became more naturalistic and gritty, as if these characters existed in our world. It was in the 1980s that DC Comics debuted the legendary Frank Miller comic, The Dark Knight Returns which painted Batman as a tortured, brooding, and ultimately tragic character. The Dark Knight Returns and the unparalleled success it would enjoy would influence not only the character of Batman, but also the industry as a whole, ultimately changing the entire course of the history of DC Comics. The late 80s and early 90s saw the merging of DC Comics as a subsidiary of Time Warner. With this major acquisition, the first major film starring Batman was released in 1989 under the leadership of Tim Burton. It proved to be a smash hit, and throughout the 90s further Batman films would arrive of highly varying quality. In fact, the Joel Schumacher mortally wounded the character of Batman. However, the release of Christopher Nolan’s Dark Knight trilogy would regain the gravitas that the character had lost in the 90s, and the success of these films would translate not only into further success for DC Comics, but eventually into the DC Cinematic Universe that we find ourselves in the midst of today. The history of DC Comics is not isolated. Rather, the history of DC Comics is the history of the comic book industry as a whole, layered with intrigue, greed, great stories, politics, financial hell holes, but ultimately an innate desire in all of us for a great story.